Yes, I’m proud of this book. David Clohessy, of SNAP introduced me. Thanks so much David! It was so great to see you all. I really enjoyed reading to all of you. Trying for the personal touch whils signing a copy of SPLIT. Arriving at the store and finding this poster was immensely exciting. I was completely jazzed by everyone. Wow, look at that crowd. Book signing can be unexpectedly intimate. The launch party for SPLIT exceeded all my expectations. It also surprised the University Book Store. I now hold the record for most books sold at a launch party at the Bellevue store. Hooray for me, but even bigger cheers for all the folks who attended and bought copies. Thank you all! And a special thanks to friends who took the pictures above. Gordon, Doug, Jim, Kate and Mary Ann. It didn’t hurt a bit that the book is absolutely beautiful. I’m so thankful for my cover designer Kathy, who did a great job. And I highly recommend IngramSpark. Their printed product is first rate. Thanks everyone for making this another magical moment for me. It was so gratifying, as an author, to look out at a room overflowing with friends who love me and people interested in my topic. Rather than yammering on myself about how fabulous the party was, I think I’ll turn the stage over to a few folks who sent inspiring notes about the evening. Dear Mary, here are some shots from your gala, moving reading last night, thank you so much for inviting me, I was touched by your story and am touched by your friendship. I’m so glad I came to the book launch. Of course there were many difficult things to address but you did so with aplomb. Wow! Over a hundred people came to to hear mi esposa, Mary Dispenza, read from her just released memoir. David Clohessy, national director of SNAP, came from St. Louis to introduce her. Congratulations, Mary! Of course there were many more kind comments at the party itself. I wish I’d written them all down! Thanks to each every one of you for walking this journey with me. I could not have come to this point without you. Thank you for contacting me. I would love to have tea or coffee with you and share the bit of wisdom I have gleaned from publishing my book. Also, please read my book if you can. 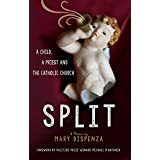 It’s called “SPLIT: A Child, A Priest, and the Catholic Church.” Mercer Island book store has it. Maybe we could meet at the restaurant next door to the bookstore for a bite and conversation. Let me know what would work for you. You may have a idea also. I heard about you and your book through a friend whose local bookstore is the one on Mercer Island. I have written a memoir about my time with 40 other women in a lay institute in the 1960s in Cleveland, Ohio. Most of us were sexually abused and abused in other ways by the priest who founded the group. I am trying to sell my memoir–no luck so far, but I’m determined to get this story out. I’d love to know how you decided on the form of publishing you chose and how you found the experience. Best of luck with your book! It’s a long journey, isn’t it?